In February this year, Facebook has announced a new feature in which Facebook videos will start automatically playing with sound as the user will scroll through News Feed in his profile. Previously users have to tap into the video to enable volume but now they will hear the volume when they will scroll to the video. The sound will fade as users’ scroll away from the video. Users are finding this feature annoying as it makes their Facebook browsing noisy. The simplest way is to put your phone in silent mode. Facebook video feature works according to your phone settings. If you put your Android device on silent mode, you will not hear the video sound autoplay on Facebook. Another option is to control your phone’s volume. Hold the volume button down to turn it off. Tap on the three horizontal lines at the top right corner. Scroll down to ‘Help & Settings’ section. Tap on ‘App Settings’ option. You just need to change this option once and you won’t hear sound for autoplay videos. If you want to listen to the video, just tap on it. 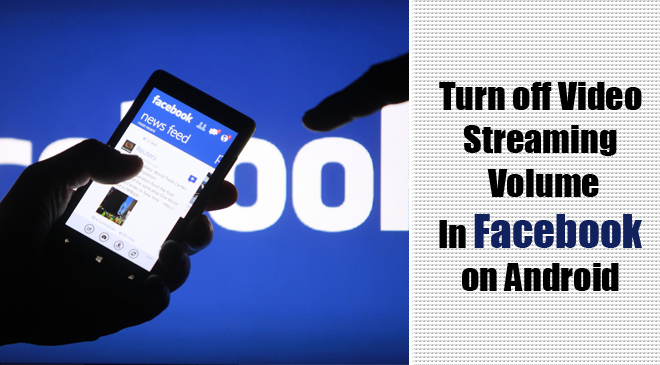 Along with turning off sound, you can also stop the automatic streaming of videos on Facebook News Feed. There are options to adjust video autoplay settings on mobile data and Wi-Fi connection, on Wi-Fi only or never autoplay videos. Scroll down and tap ‘App Settings’ option. Choose ‘Never Autoplay Videos’ or others if you want. Important: If you can’t see the ‘Autoplay’ option in ‘App Settings’, log out and log in again. Issue will be resolved. Videos will not autoplay when you scroll down to your Facebook News Feed. If you want to see them, tap them to play. Get in touch with Facebook support for any assistance.